Who has never drifted off into a dream when hearing the names of Tahiti or Bora Bora…? Diaphanous lagoons, multi-coloured fish, a seabed in the hues of the rainbow, fruit and flowers in abundance, a friendly and lively population, songs accompanied by the strumming of yukeleles, all this is an invitation to escape to these islands at the other end of the world. French Polynesia consists of 118 islands situated in the middle of the Pacific, between 10 and 25 degrees south, 6500 kms from California and 5400 kms from Australia. 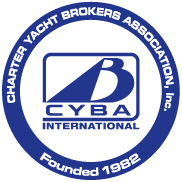 The Tahiti Yacht Charter base at Raiatea, 2 km from the airport, is convenient for the heart of the Leeward Islands. A landing stage is also available at the Quai des Yachts in Papeete. Lying 180 miles from Tahiti, the jewel-like Tuamotu islands are the ideal spot for deep sea diving. The beauty of the lagoons will delight water sport fans and navigators inspired by a Robinson Crusoe spirit. A base at Tikehau has facilities for bareboat charters, for exploring some magnificent atolls, such as those of Rangiroa. However, navigation is more difficult in these waters and demands a high level of experience. The most convenient charter base is situated in the gentle lagoon of the island of Raiatea, one of the Leeward Islands within the Society Archipelago, named as such by that redoubtable navigator, Captain James Cook back in 1769. 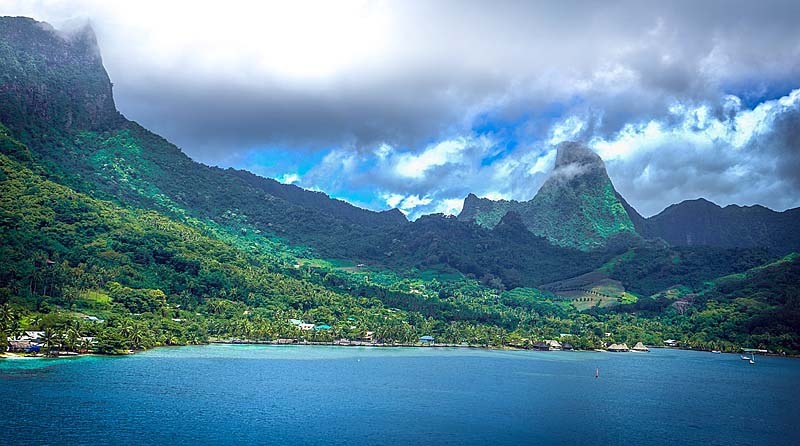 It’s the sailing capital of French Polynesia on account its favoured location, just a 40-minute flight from Tahiti’s international airport and, more importantly, with four of the main islands within 5 hours of relatively easy sailing. They are all volcanic high islands with majestic mountain peaks and luxuriant vegetation. Their reefs protect the sheltered crystalline waters of lagoons that teem with fish. The reef line itself is broken by strings of small islands called motu with white sand beaches and coconut palms swaying in the tropical breezes. At first glance they are similar but in fact they are bathed in their own individual atmospheres. Raiatea the Sacred is a place of magic and mystery. Taha’a, its smaller sister island, sits in the same lagoon and is dubbed the Vanilla Island for the number and quality of its plantations. Bora-Bora, known worldwide as the Pearl of the Pacific, is justly famous for its jagged summits and lagoon. Huahine remains wild and secret, authentic and proud, and relatively untouched by the modern world. You can get a good taste of these very special islands in a 1 or 2 week cruise, depending on your pace. 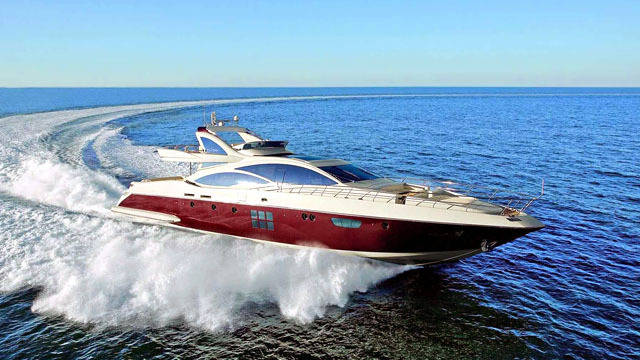 If required, we can arrange for your yacht to be waiting at the port of Papeete on the main island of Tahiti where your international flight will arrive. 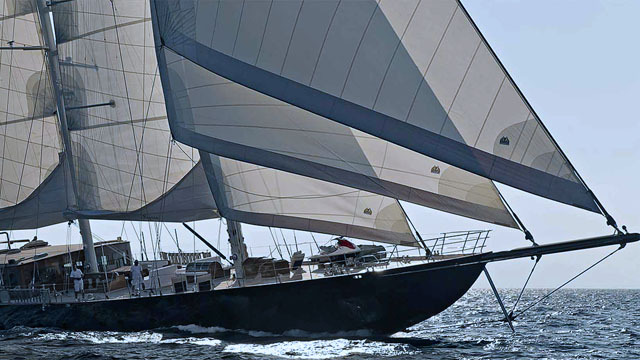 Sailing time from there to the Leeward Islands is some 24 hours and night watches are obligatory. If you are looking for isolation, imagine a group of some 20 mountainous volcanic islands against whose steep cliffs waves crash that have rolled for 4000 miles! The Marquesas lie between 800 and 900 miles or 7 to 10 days’ sailing from Raiatea. Even the planes from Tahiti take 31/2 hours and the Marquesas are far enough away to warrant a 30-minute time zone change. This isolation has helped them retain the wild charm that has attracted not only sailors but such notable artists as painter Paul Gauguin and singer Jacques Brel, both of whom lie in the graveyard at Atuona on Hiva Oa. 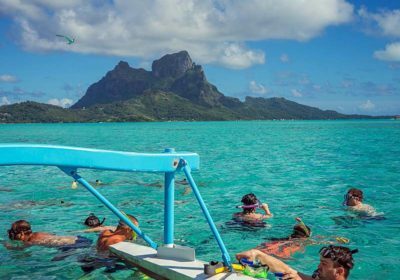 It’s another captivating face of Polynesia where you will find spectacular scenery though no coral reef (therefore no lagoons), innumerable little bays and creeks and luxuriant vegetation. 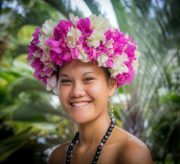 Hiva Oa and Nuku Hiva are the most visited islands where you can moor and go ashore to meet the very friendly locals and experience a vibrant culture. It was in these islands that the art of tattooing reached its most intricate form and where some of the best wood carvers still live. 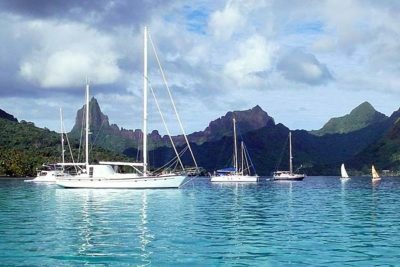 Owing to their distance and local conditions, bareboat charters in the Marquesas require an experienced skipper aboard. If you sail NE from Raiatea you will come to another archipelago, the Tuamotu, a series of low coral atolls with their own atmosphere and way of life. Here the stresses and strains of modern life are easily left behind and you can play at being a latter day Robinson Crusoe. The atolls enclose crystal clear lagoons in whose waters much of local pearl farming is located. With the abundance of their colorful fish life, they are renowned for their snorkelling and diving. Rangiroa is the largest of the atolls with a lagoon so vast that the whole island of Tahiti could be dropped into its immensity. Its best-known places are the beach beside the Blue Lagoon, Tiputa Point for its panoramic views and Reef Island for unusual fossilized corals. 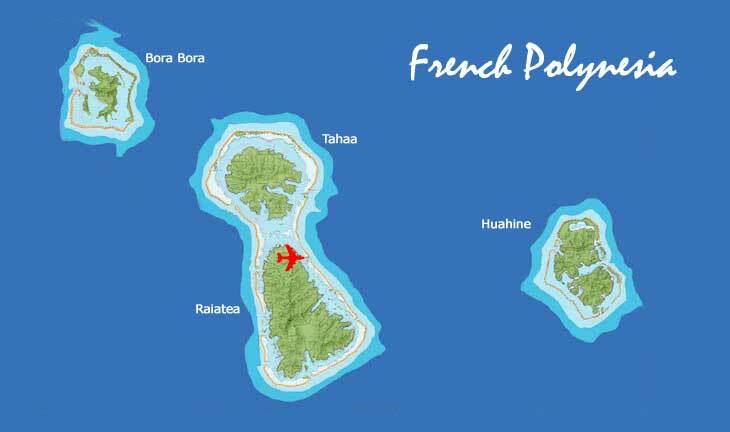 Rangiroa is a one hour flight from Papeete and we recommend a charter of 7 to 12 days within the Tuamotu. Apart from Rangiroa, we recommend the atolls of Tikehau and of Fakarava, so special it has been named “World Heritage” by UNESCO. Intrepid bareboat sailors note: As with the Marquestas, in the waters of the Tuamotu, for your own safety and that of your yacht (coral and other navigational hazards), a professional skipper is mandatory.